Several years ago, Miss Ayn Rand wrote The Fountainhead. Despite a generally poor press, it is said to have sold some four hundred thousand copies. Thus, it became a wonder of the book trade of a kind that publishers dream about after taxes. So Atlas Shrugged had a first printing of one hundred thousand copies. It appears to be slowly climbing the best-seller lists. Since a great many of us dislike much that Miss Rand dislikes, quite as heartily as she does, many incline to take her at her word. It is the more persuasive, in some quarters, because the author deals wholly in the blackest blacks and the whitest whites. In this fiction everything, everybody, is either all good or all bad, without any of those intermediate shades which, in life, complicate reality and perplex the eye that seeks to probe it truly. This kind of simplifying pattern, of course, gives charm to most primitive story-telling. And, in fact, the somewhat ferro-concrete fairy tale the author pours here is, basically, the old one known as: The War between the Children of Light and the Children of Darkness. In modern dress, it is a class war. Both sides to it are caricatures. The Children of Light are largely operatic caricatures. In so far as any of them suggests anything known to the business community, they resemble the occasional curmudgeon millionaire, tales about whose outrageously crude and shrewd eccentricities sometimes provide the lighter moments in Board rooms. Otherwise, the Children of Light are geniuses. One of them is named (the only smile you see will be your own): Francisco Domingo Carlos Andres Sebastian d’Anconia. This electrifying youth is the world’s biggest copper tycoon. Another, no less electrifying, is named: Ragnar Danesjöld. He becomes a twentieth-century pirate. All Miss Rand’s chief heroes are also breathtakingly beautiful. So is her heroine (she is rather fetchingly vice president in charge of management of a transcontinental railroad). So much radiant energy might seem to serve a eugenic purpose. For, in this story as in Mark Twain‘s, “all the knights marry the princess” — though without benefit of clergy. Yet from the impromptu and surprisingly gymnastic matings of the heroine and three of the heroes, no children — it suddenly strikes you — ever result. The possibility is never entertained. And, indeed, the strenuously sterile world of Atlas Shrugged is scarcely a place for children. You speculate that, in life, children probably irk the author and may make her uneasy. How could it be otherwise when she admiringly names a banker character (by what seems to me a humorless master-stroke): Midas Mulligan? You may fool some adults; you can’t fool little boys and girls with such stuff — not for long. They may not know just what is out of line, but they stir uneasily. “Looters” loot because they believe in Robin Hood, and have got a lot of other people believing in him, too. Robin Hood is the author’s image of absolute evil — robbing the strong (and hence good) to give to the weak (and hence no good). All “looters” are base, envious, twisted, malignant minds, motivated wholly by greed for power, combined with the lust of the weak to tear down the strong, out of a deep-seated hatred of life and secret longing for destruction and death. There happens to be a tiny (repeat: tiny) seed of truth in this. The full clinical diagnosis can be read in the pages of Friedrich Nietzsche. (Here I must break in with an aside. Miss Rand acknowledges a grudging debt to one, and only one, earlier philosopher: Aristotle. I submit that she is indebted, and much more heavily, to Nietzsche. Just as her operatic businessmen are, in fact, Nietzschean supermen, so her ulcerous leftists are Nietzsche’s “last men,” both deformed in a way to sicken the fastidious recluse of Sils Maria. And much else comes, consciously or not, from the same source.) Happily, in Atlas Shrugged (though not in life), all the Children of Darkness are utterly incompetent. So the Children of Light win handily by declaring a general strike of brains, of which they have a monopoly, letting the world go, literally, to smash. In the end, they troop out of their Rocky Mountain hideaway to repossess the ruins. It is then, in the book’s last line, that a character traces in the air, “over the desolate earth,” the Sign of the Dollar, in lieu of the Sign of the Cross, and in token that a suitably prostrate mankind is at last ready, for its sins, to be redeemed from the related evils of religion and social reform (the “mysticism of mind” and the “mysticism of muscle”). That Dollar Sign is not merely provocative, though we sense a sophomoric intent to raise the pious hair on susceptible heads. More importantly, it is meant to seal the fact that mankind is ready to submit abjectly to an elite of technocrats, and their accessories, in a New Order, enlightened and instructed by Miss Rand’s ideas that the good life is one which “has resolved personal worth into exchange value,” “has left no other nexus between man and man than naked self-interest, than callous ‘cash-payment. '” The author is explicit, in fact deafening, about these prerequisites. Lest you should be in any doubt after 1168 pages, she assures you with a final stamp of the foot in a postscript: “And I mean it.” But the words quoted above are those of Karl Marx. He, too, admired “naked self-interest” (in its time and place), and for much the same reasons as Miss Rand: because, he believed, it cleared away the cobwebs of religion and led to prodigies of industrial and cognate accomplishment. The overlap is not as incongruous as it looks. 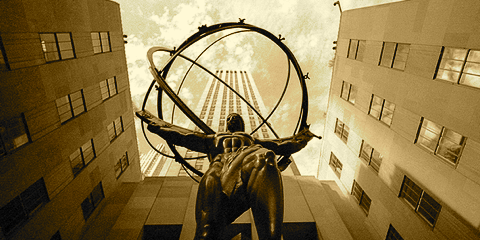 Atlas Shrugged can be called a novel only by devaluing the term. It is a massive tract for the times. Its story merely serves Miss Rand to get the customers inside the tent, and as a soapbox for delivering her Message. The Message is the thing. It is, in sum, a forthright philosophic materialism. Upperclassmen might incline to sniff and say that the author has, with vast effort, contrived a simple materialist system, one, intellectually, at about the stage of the oxcart, though without mastering the principle of the wheel. Like any consistent materialism, this one begins by rejecting God, religion, original sin, etc. etc. (This book’s aggressive atheism and rather unbuttoned “higher morality,” which chiefly outrage some readers, are, in fact, secondary ripples, and result inevitably from its underpinning premises.) Thus, Randian Man, like Marxian Man, is made the center of a godless world. At that point, in any materialism, the main possibilities open up to Man. 1) His tragic fate becomes, without God, more tragic and much lonelier. In general, the tragedy deepens according to the degree of pessimism or stoicism with which he conducts his “hopeless encounter between human questioning and the silent universe.” Or, 2) Man’s fate ceases to be tragic at all. Tragedy is bypassed by the pursuit of happiness. Tragedy is henceforth pointless. Henceforth man’s fate, without God, is up to him, and to him alone. His happiness, in strict materialist terms, lies with his own workaday hands and ingenious brain. His happiness becomes, in Miss Rand’s words, “the moral purpose of his life.” Here occurs a little rub whose effects are just as observable in a free enterprise system, which is in practice materialist (whatever else it claims or supposes itself to be), as they would be under an atheist Socialism, if one were ever to deliver that material abundance that all promise. The rub is that the pursuit of happiness, as an end in itself, tends automatically, and widely, to be replaced by the pursuit of pleasure, with a consequent general softening of the fibers of will, intelligence, spirit. No doubt, Miss Rand has brooded upon that little rub. Hence, in part, I presume, her insistence on “man as a heroic being” “with productive achievement as his noblest activity.” For, if Man’s “heroism” (some will prefer to say: “human dignity”) no longer derives from God, or is not a function of that godless integrity which was a root of Nietzsche’s anguish, then Man becomes merely the most consuming of animals, with glut as the condition of his happiness and its replenishment his foremost activity. So Randian Man, at least in his ruling caste, has to be held “heroic” in order not to be beastly. And this, of course, suits the author’s economics and the politics that must arise from them. For politics, of course, arise, though the author of Atlas Shrugged stares stonily past them, as if this book were not what, in fact, it is, essentially — a political book. And here begins mischief. Systems of philosophic materialism, so long as they merely circle outside this world’s atmosphere, matter little to most of us. The trouble is that they keep coming down to earth. It is when a system of materialist ideas presumes to give positive answers to real problems of our real life that mischief starts. In an age like ours, in which a highly complex technological society is everywhere in a high state of instability, such answers, however philosophic, translate quickly into political realities. And in the degree to which problems of complexity and instability are most bewildering to masses of men, a temptation sets in to let some species of Big Brother solve and supervise them. One Big Brother is, of course, a socializing elite (as we know, several cut-rate brands are on the shelves). Miss Rand, as the enemy of any socializing force, calls in a Big Brother of her own contriving to do battle with the other. In the name of free enterprise, therefore, she plumps for a technocratic elite (I find no more inclusive word than technocratic to bracket the industrial-financial-engineering caste she seems to have in mind). When she calls “productive achievement” man’s “noblest activity,” she means, almost exclusively, technological achievement, supervised by such a managerial political bureau. She might object that she means much, much more; and we can freely entertain her objections. But, in sum, that is just what she means. For that is what, in reality, it works out to. And in reality, too, by contrast with fiction, this can only head into a dictatorship, however benign, living and acting beyond good and evil, a law unto itself (as Miss Rand believes it should be), and feeling any restraint on itself as, in practice, criminal, and, in morals, vicious — as Miss Rand clearly feels it to be. Of course, Miss Rand nowhere calls for a dictatorship. I take her to be calling for an aristocracy of talents. We cannot labor here why, in the modern world, the pre-conditions for aristocracy, an organic growth, no longer exist, so that impulse toward aristocracy always emerges now in the form of dictatorship. Nor has the author, apparently, brooded on the degree to which, in a wicked world, a materialism of the Right and a materialism of the Left first surprisingly resemble, then, in action, tend to blend each with each, because, while differing at the top in avowed purpose, and possibly in conflict there, at bottom they are much the same thing. The embarrassing similarities between Hitler‘s National Socialism and Stalin’s brand of Communism are familiar. For the world, as seen in materialist view from the Right, scarcely differs from the same world seen in materialist view from the Left. The question becomes chiefly: who is to run that world in whose interests, or perhaps, at best, who can run it more efficiently? Something of this implication is fixed in the book’s dictatorial tone, which is much its most striking feature. Out of a lifetime of reading, I can recall no other book in which a tone of overriding arrogance was so implacably sustained. Its shrillness is without reprieve. Its dogmatism is without appeal. In addition, the mind which finds this tone natural to it shares other characteristics of its type. 1) It consistently mistakes raw force for strength, and the rawer the force, the more reverent the posture of the mind before it. 2) It supposes itself to be the bringer of a final revelation. Therefore, resistance to the Message cannot be tolerated because disagreement can never be merely honest, prudent, or just humanly fallible. Dissent from revelation so final (because, the author would say, so reasonable) can only be willfully wicked. There are ways of dealing with such wickedness, and, in fact, right reason itself enjoins them. From almost any page of Atlas Shrugged, a voice can be heard, from painful necessity, commanding: “To a gas chamber — go!” The same inflexibly self-righteous stance results, too (in the total absence of any saving humor), in odd extravagances of inflection and gesture — that Dollar Sign, for example. At first, we try to tell ourselves that these are just lapses, that this mind has, somehow, mislaid the discriminating knack that most of us pray will warn us in time of the difference between what is effective and firm, and what is wildly grotesque and excessive. Soon we suspect something worse. We suspect that this mind finds, precisely in extravagance, some exalting merit; feels a surging release of power and passion precisely in smashing up the house. A tornado might feel this way, or Carrie Nation. We struggle to be just. For we cannot help feel at least a sympathetic pain before the sheer labor, discipline, and patient craftsmanship that went to making this mountain of words. But the words keep shouting us down. In the end that tone dominates. But it should be its own antidote, warning us that anything it shouts is best taken with the usual reservations with which we might sip a patent medicine. Some may like the flavor. In any case, the brew is probably without lasting ill effects. But it is not a cure for anything. Nor would we, ordinarily, place much confidence in the diagnosis of a doctor who supposes that the Hippocratic Oath is a kind of curse.